Here’s all the latest news from The Co-op Credit Union, as we’re counting down to Christmas, celebrating our 20th Anniversary and supporting Social Enterprise UK’s ‘Social Saturday 2018’. 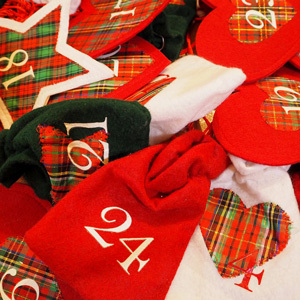 With less than 9 weeks to go until Christmas, the countdown has most definitely begun. And, whilst it’s not quite time to decorate the tree just yet, it’s certainly time to start thinking about your Christmas budget plans to avoid being stung by high-cost credit if you need a helping hand. Each year, we help hundreds of our members spread the cost of Christmas with one of our affordable loans. Members can borrow from just £50 to £15,000 and repay in instalments over the next 12 months, helping to take the stress out of the festive season. 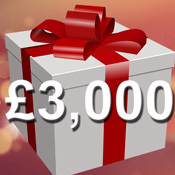 There’s a total prize fund of £3,000 up for grabs in this December’s bumper Christmas lottery draw. The top prize will be £1,000 with an additional 8 prizes, ranging from £750 to £100. Think what a great boost to the Christmas funds that would be! All our current lottery members will be included in the draw, however, if you’re not currently a member, now is a great time to join. One monthly entry to the lottery costs £1, and you can buy up to 10 entries in total. The last date to join to be included in the Christmas draw is 5th November. Join the lottery now for your chance of a share of the Bumper £3,000 prize fund. 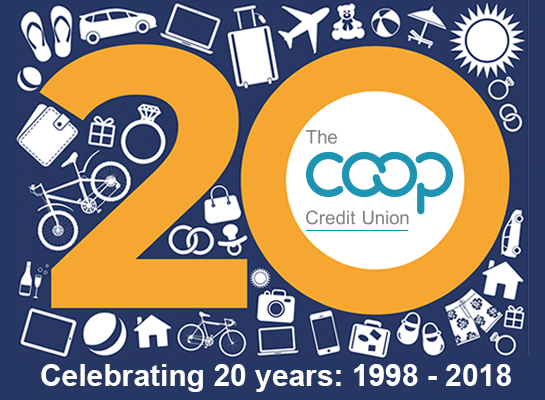 This month marks the 20th Anniversary of The Co-op Credit Union, and we’d like to say a big thank you to all our members for all their support over the years, in helping us reach this important milestone! 20 years on, and our aim still remains to provide our members with a simple mechanism for saving and borrowing at affordable rates. Since its formation in 1998, the credit union now has more than 8,500 members drawn from a range of co-operative organisations across the UK. Here’s to the next 20 years! We were delighted to be part of the launch for #SocialSaturday2018 this month. Social Saturday is an annual event designed to celebrate and share the power of Social Enterprises and to encourage consumers to buy from them. 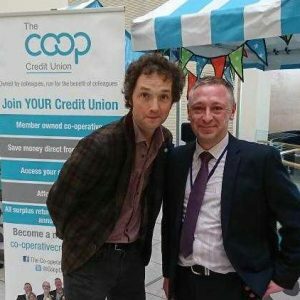 As well as talking to co-op employees and signing up new members on our stand, we also had the chance to meet other social enterprises taking part, and the Patron of Social Enterprise UK, Comedian Chris Addison (pictured above with our Operations Manager, Andrew Davey). 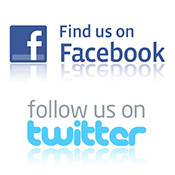 We regularly post updates on what’s going on at The Credit Union, and it’s a great way to keep in touch too! This entry was written by Credit Union, posted on October 9, 2018 at 1:31 pm, filed under Latest News. Bookmark the permalink. Follow any comments here with the RSS feed for this post. Both comments and trackbacks are currently closed. « We’re Celebrating our 20th Anniversary Today! Check to see if you are a winner! Not a member yet? Apply to join The Co-op Credit Union today.